Work on my current game project continues, but I’ve also been busy creating a new set of videos and tutorials for the game development class that I teach. 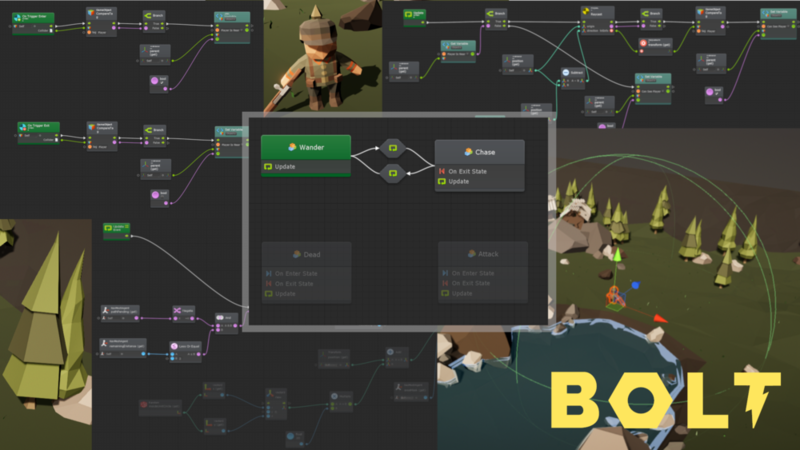 This year I made the decision to drop Playmaker, the visual scripting tool I’ve used for the last three years, in favor of Bolt. I’m three months into the class and I’m very glad I made the switch. If your curious why, I put most of my reasoning into a video that looks at the pros and cons of each platform. I’ve had great fun learning the new platform and creating videos to support my students. Since Bolt is fairly new its a bit short on tutorials, especially compared to Playmaker. This shortage of tutorials made it pretty easy to push my way into the scene and start to create my own little niche in the larger YouTube community. Let’s be clear! My channel is tiny. My channel started as a place to host a game trailer and evolved into an attempt to support my class. When looking at the analytics it’s pretty clear there’s an inflection point in the traffic stats when I released the first few Bolt videos. It’s fun to watch. It’s fun to create. And it’s fun to think about how far this trend might go. The question that keeps nagging me is whether the graph is linear? Or could it be curving upwards? Can the channel sustain the recent 25-30% month on month growth? Can the subscriber growth continue at 40% per month? Can I continue to create weekly content that’s engaging? I’ve seen spikes in the channel stats before, but this time feels a bit different. And this time I’ve started asking a different question. Two years worth of data. The trend becomes a little more clear. Could my channel help support my game development? I don’t mean that next month I quit my job, but if that graph is curving maybe in 2-3 months the channel can cover my Unity subscription? If it continues to curve in 6 months could it pay my monthly internet bill as well? And then…? And if the graph isn’t curving? If it’s straight as an arrow? Or if starts to curve towards horizontal? What then? Then I’ve had fun and given back to a community that taught me how to make games. Screenshots from the next handful of tutorial videos.